If you’re hanging around Georgia for New Year’s Eve, you’ll be glad to know you’ll be in good company as you say hello to the new year. Georgia folks know how to celebrate, and there are plenty of events where you can welcome the new year. Everyone in the family will enjoy these 10 best New Year’s Eve events in Georgia. Being in the south, something as radical as a possum drop should surprise no one. Every year, townspeople gather to hear live bands as they eagerly await the final few seconds before midnight. Local restaurants are on site providing food and beverages, while families can enjoy the kid’s area. There’s fun for all ages, and its unique name alone should tell you this even is not to be missed. If you thought a possum drop would be the most interesting NYE celebration, you probably didn’t know there’s also a buzzard drop in Georgia. Perry townsfolk pay homage to the buzzard population that returns to the city each year. Dancing, live music, and plenty of adult beverages complement the event. As one of the largest botanical gardens in the state, this holiday light display remains long after Santa has come and gone. Once you explore the light displays, head to Robin Lake Beach for live music and other entertainment as you welcome the new year. There’s also a bed and breakfast on site so you can extend your celebration. While other parts of Georgia are busy dropping buzzards and possum, the folks in Savannah are raising their glasses to a prosperous new year. Happening right on the waterfront, this all-day event is highly anticipated each year, offering fun for the whole family. Apparently Georgia is known for New Year’s Eve ball drops that use everything but actual balls. The Shamrock Drop is a tribute to Dublin’s Irish roots, culminating the town’s largest annual street party. Guests can expect live music, entertainment, photo booths, food vendors and more, all against the warm glow of the Theater Dublin marquee. Paying homage to its German roots, the city of Helen hosts an annual Dropping of the Edelweiss, or in this case a large icon of the motherland’s native flower. The family-friendly festival also offers live music, food, cocktails, a champagne toast, and party favors. If you’ve never been to Helen, or just can’t get enough of this charming town, you won’t want to miss this endearing celebration. The dropping of the Edelweiss. Happy New Year! 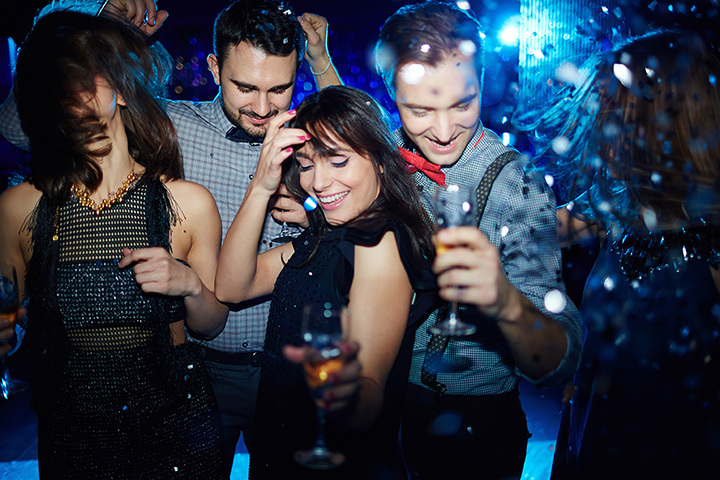 Kids like to party, too, and Starlite Family Fun Center of Stockbridge can help them ring in the new year safely. Their late-night skate features a $1,000 balloon drop, cash prizes, pizza, soda, and skate rental. The party is hopping until 1 a.m., giving your kids the thrill of their life. A fantastic activity for young children would be to head to LEGOLAND Discovery Center on Dec. 31 to participate in their New Year’s Eve celebrations! There is an annual balloon drop at noon and tickets can be purchased ahead of time. Head to the Children’s Museum of Atlanta for their very own children’s party! There will be a dance party, special guests, fun with bubbles, and even a few surprises! The event is held from 10-12:30 p.m. and 2-4:30 p.m. Tickets must be purchased ahead of time and can be done so on their website. Come to the Battery Atlanta on New Year’s Eve for a fun filled bash for all ages. There will be child geared and family-friendly events from 5:30-8 p.m. and adult-themed events from 9 p.m. to 12:30 a.m. The best part. It’s all FREE. There will be live music, performances, ice skating and much more! You don’t want to miss out! Come on out and Skate today!